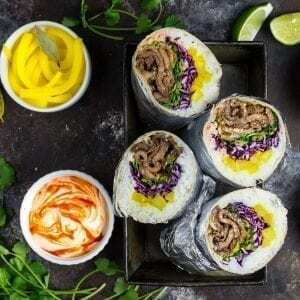 Korean bulgogi burritos – tender soy and sugar marinated beef, charred crisp and wrapped in a burrito with a rainbow of vegetables. A delight for the palate … and the palette. We always strive to make sure a recipe tastes good. That’s the brass ring of home cooking. If it also looks appetizing, that’s a pretty nice goal to achieve. We’ll admit, though, that cooked meat tends towards the … there’s no better way to say this … brown part of the spectrum. It’s just a fact of life. A dish that pops all over the color wheel isn’t something you tend to encounter much past childhood jello desserts. 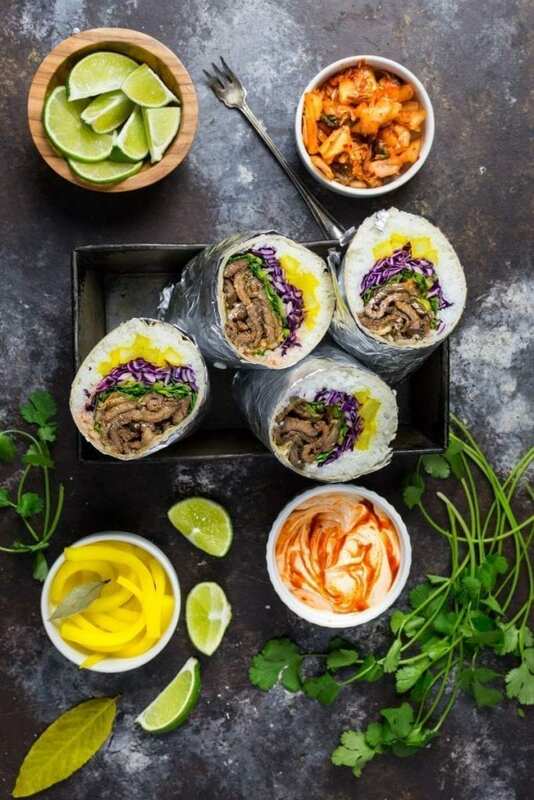 That’s one reason we’re particularly proud of these Korean bulgogi burritos. Besides the fact that they’re insanely, addictively delicious, they’re also delightful to look at. There’s yellow, purple, red, green – and all without resorting to artificial coloring. Let’s dive in. Bulgogi (“fire-meat” in Korean) is thinly sliced beef, marinated and quickly pan-seared. It’s usually made with pricey ribeye but you can also use English-cut boneless short ribs (our favorite), or sirloin. If you’re slicing the beef yourself, you’ll want it as thin as you can get it (use a very sharp knife) – 1/8″ or less is ideal, and slice against the grain of the meat which helps make it more tender. Ribeye by nature is very tender, but if you’re using short ribs or sirloin instead, they’ll need to be tenderized while marinating – and for that, we add a little grated Asian pear, which contains the calpain enzyme. You can find this variety with the other pears in the fruit aisle of good supermarkets – it’s round, like an apple (it may even be marked as “apple pear”). You could also use a little pineapple juice in a pinch, but if you do, don’t marinate the beef for more than a couple of hours since it has a stronger enzymatic action and can make the meat mushy. Classic bulgogi will feature beef marinated in a mixture of mostly soy sauce, sugar and mirin (sweet rice wine), pan-fried or quick-grilled and served with lettuce leaves and various side dishes such as kimchi. We’ve taken all those flavors and substituted a burrito wrap for the lettuce, making it into a wrap perfect for either a sit-down dinner or a meal on the go. We recommend using a large cast-iron or heavy stainless steel skillet in order to get the maximum char on the edges of the beef. The other recipe we’ve included here is for pickled Daikon radish, called danmuji. The delightful yellow color comes from the turmeric that we use in the pickle brine. You can (and should) make this a few days ahead of the burritos to allow the pickle to fully develop. Traditionally you’ll find this pickle sliced in thin rounds but we sliced the radish lengthways so it would fit snugly into the wrap with the other ingredients and not fall out while you’re biting into it. It will last in the refrigerator for at least a month. The turmeric is the key ingredient for getting that bright yellow color. We’ve also used store-bought kimchi (if you make your own, we salute you). All the other ingredients for the burritos are raw – shredded red cabbage, cilantro (not traditionally Korean but delicious here nonetheless), scallions, limes to squeeze, and finally a little sour cream mixed with spicy gochujong paste. Honestly, anything you like in a traditional burrito would probably be great in this – avocado, pickled red onions and shredded lettuce come to mind. Just remember that the bulgogi is the star. We recommend extra-large (12″) flour tortillas which have been lightly warmed, to soften, in a low oven between sheets of damp paper towel. 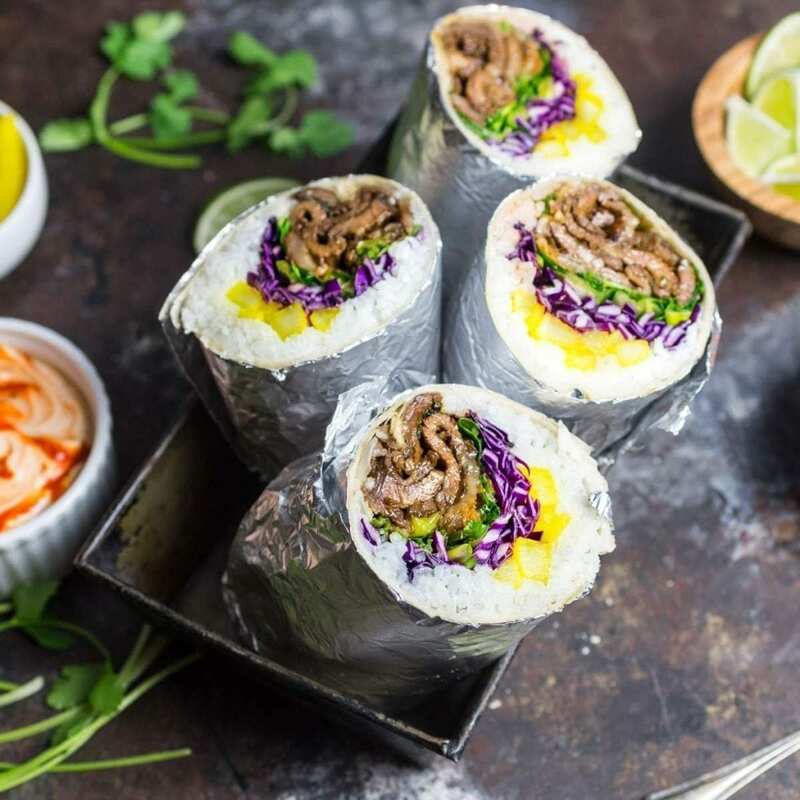 We initially tried using standard 10″ tortillas, but the burrito they created just wasn’t big enough to pack in all our bulgogi goodies. You can layer the rice pretty thinly, since it’s really acting as a sushi-roll-like outer wall for the other contents to nestle into. Serve it with a little sour cream swirled with gochujang for a spicy-hot side sauce, and provide a few quartered limes for squeezing. And maybe a beer or three. The recipe we’ve put together should fill four quite large burritos – and of course you can slice them in two, as we have, as a lighter meal for more mouths. If you made too much for one sitting, they will be happily re-heated – completely wrap them in foil and place in a 325F oven for around 20 minutes. 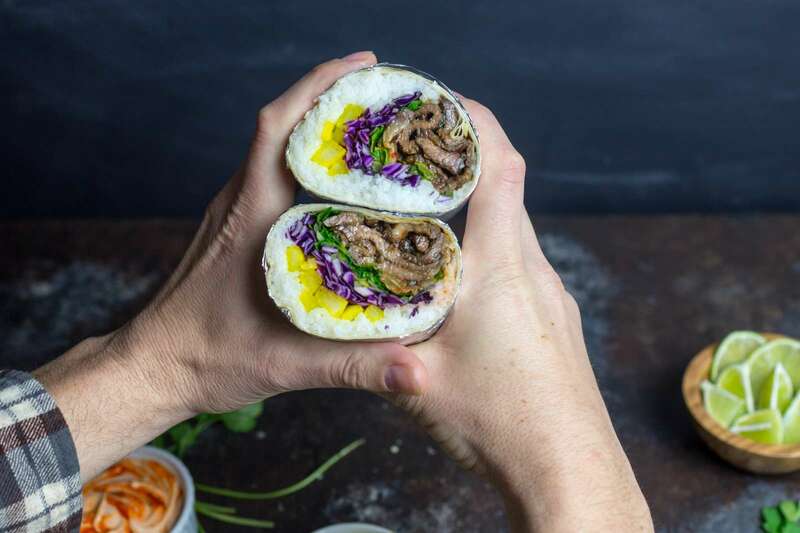 These Korean bulgogi burritos are quite a handful! And there you have it. 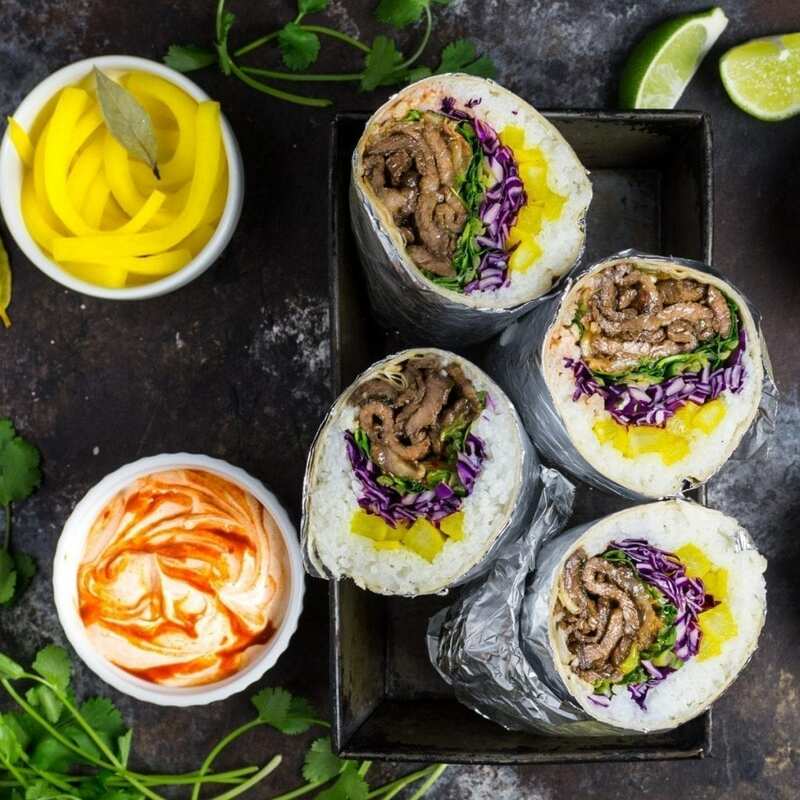 All the flavors of a bulgogi, all the convenience of a burrito, all (well, most of) the colors of the rainbow. There’s nothing wrong with a little excess every now and again. In a medium saucepan, stir together water, vinegar, sugar, salt, garlic, turmeric, peppercorns, and bay leaves. Bring to a boil over medium-high heat, stirring to ensure that sugar fully dissolves. Remove from heat and add daikon. Press a paper towel directly against the surface of the brine and let cool to room temperature, 1 to 2 hours. Transfer pickles and brine to an airtight glass container and store in the refrigerator. (The turmeric will stain a plastic container yellow.) Pickles will last about 1 month. In a large bowl, whisk together soy sauce, sugar, sesame oil, Asian pear, garlic, and ginger. When sugar has dissolved, add beef, scallion, and onion slices to bowl and toss to coat. Cover and refrigerate for at least 1 hour or up to overnight. In a large cast iron or heavy stainless steel skillet, heat 1 tablespoon (15ml) oil over medium-high heat until shimmering. Working in batches, add beef and onions, working quickly to arrange them in a flat, even layer against bottom of skillet; try not to overcrowd pan. Cook on one side for 1 minute, then flip and cook second side until browned and crisp in spots, about 2 minutes longer. Transfer cooked beef and onions to a plate and repeat with remaining beef, onions, and oil. In a small bowl, stir together sour cream and gochujang. 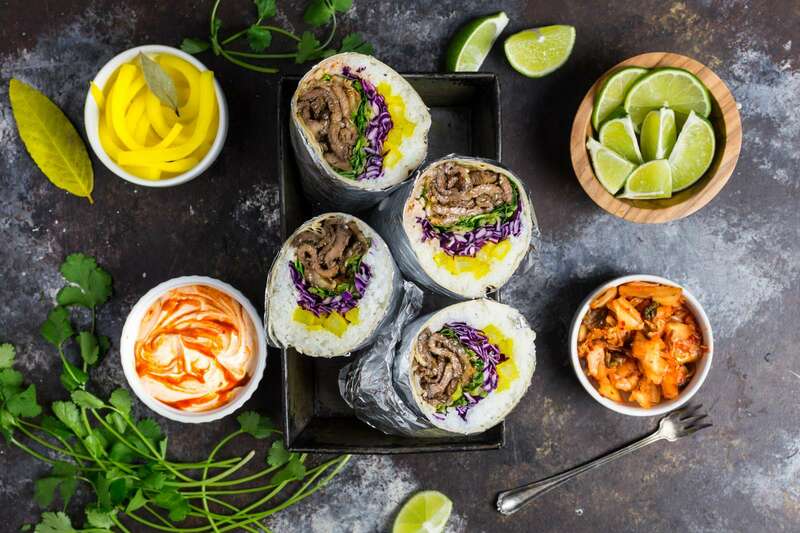 Spread rice onto warm tortillas, then top with a layer of beef and onions, followed by kimchi, a few pickled daikon radish strips, red cabbage, cilantro, scallions, and gochujang sour cream. Roll tightly, folding sides of tortilla in as you go. (Wrapping the burritos in foil will make them portable and less messy to eat.) Serve with lime wedges. This remind me of something I get at one of my favorite food carts. Can’t wait to try these at home. this was awesome! Modifications: Ran out of sour cream =( and I had some pickled vegetables already made so I used that.